With the advancements in the technology and specifically vehicle tech, cars have seen some significant advantages over the years. A modern car now has so many parts and electronic sensors that handle much of how your car drives and burns fuel. Out of all those sensors, one if the DPFE sensor. DPFE is short for “Delta Pressure Feedback of EGR” whose purpose is to monitor the changes in the pressure of the EGR. All this might sound very confusing as even many car fanatics don’t usually hear the name of DPFE or EGR but worry not as after reading this, you will get a firm idea about this sensor and what it does. In this article, we will go through the function, symptoms, troubleshooting and the replacement cost of the DPFE Sensor. What is a DPFE sensor? As we just mentioned the name, the DPFE sensor is called the Delta Pressure Feedback of EGR. We will talk about EGR later. The DPFE sensor is one of the components of your engine that is there to monitor all the air that is going back in the air intake from the exhaust. Yes, you heard it correct. To improve the efficiency, cars use the air that comes out the exhaust, also called the exhausted air to re-burn it. The working of it can be related to a turbo system. The turbo unit contains a turbine inside which is powered by the exhaust gas your car releases. That exhausted air drives the turbine which in turn pulls the fresh, cooler air in the intake much faster and with a lot of force, giving your engine a right amount of boost. While the DPFE sensor is directly related to the exhaust gas, it doesn’t handle the feeding of the exhausted air. That part is controlled by the EGR system which we will talk about later in this article. The DPFE sensor, however, is what monitors the pressure difference in the air and the amount of air was going into the engine and gives feedback to the EGR system according to the readings, hence the name “Delta Pressure Feedback of EGR. In a way, the DPFE sensor informs the EGR about how much air to let in considering the situations. The DPFE sensor checks the pressure of the exhausted air and the changes in the pressure using an orifice. The output that the sensor gets is then converted into an analog signal. That signal is then sent to the car’s computer system to compare it with the previous readings and accordingly manage the EGR for optimal flow of air. From there, the computer sends a signal to the EGR system to control the exhaust air. The primary purpose of the EGR system is to reduce the amount of nitrogen oxide being released by the engine as a result of combustion. Ford uses the DPFE Sensor a lot for their different car models. The most common car model is probably the F-150. EGR, which is short for “Exhaust gas recirculation” is a mechanism which controls precisely what the name suggests. The EGR system consists of a valve which controls the exhausted air getting back into the engine. The exhaust gas is reused related to the factors of burning the fuel. The fact is that the mixture of fuel and air made by the carburetors or the throttle body isn’t burned entirely and some every time and some of it is let out from the exhaust in the form of gas not burnt 100%. Recirculating that unburnt gas ensures that it is burned again and entirely the second time, improving the fuel efficiency and most importantly, controlling the car’s emissions. A mixture that is unburnt results in the production of various harmful gases, one of which is nitrogen oxide, being released into the atmosphere. Since a lot of states have now made law and specified the emissions allowed, the proper working of the EGR system has become mandatory now. 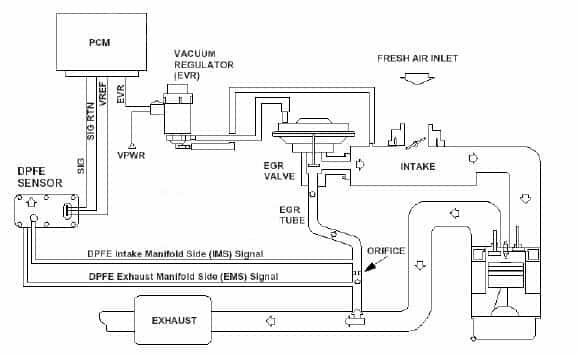 The EGR system is rather simple, having a single valve which opens and closes to the amount instructed by the car’s computer. 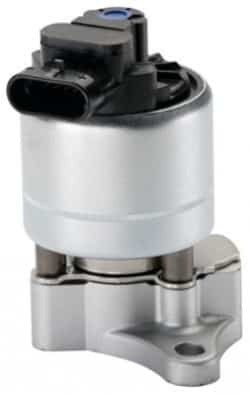 Older vehicles have mechanical EGR valves, also called pneumatic valves while modern cars have electronic EGR systems controlled accurately by the computer of the vehicle. To reduce the throttling loss on gasoline engines. Increase engine life by preventing extreme engine temperatures due to accurate burning of the fuel. What happens if the DPFE sensor fails? Like other parts, sensors tend to fail eventually. Although it’s uncommon for such sensors, some factors can cause them to fail prematurely. Since the job of the DPFE sensor is to give out accurate reading to the EGR, when the sensor fails, it will give out wrong readings. If the DPFE sends out the false signals, it will cause the EGR system to operate inaccurately. If the EGR system fails to work correctly, the PCM valve which controls how much air is to be mixed with the fuel will start to make a slender mixture of the air and fuel. The failure of the DPFE sensor will eventually cause the PCM to make a lean mixture, thinking that the circulation of the exhausted air has decreased. There are a lot of different signs to look for when you are facing a bad DPFE Sensor. Here are some of the most common symptoms. If you begin to notice that your car is starting to idle rough and shake due to that, it can mean that the DPFE sensor is not working as it should. In such cases, the engine also hesitates when you pull the throttle and feel a loss of power by the engine. If you are facing the above issues and at the same time your engine check light comes on, it could mean that your engine control unit detected any problem with the DPFE Sensor. 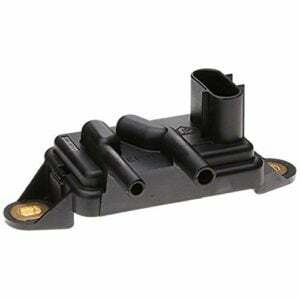 When the check engine light is ON – It does not necessarily have to be a problem with the DPFE Sensor, but it could be. This is probably the simplest symptom to look for. If your vehicle fails the emission test, you may have a problem with either the DPFE or the EGR system. If you have a bit of knowledge in cars and troubleshooting, you can test the DPFE sensor and the wirings to it yourself at home. Here are some simple things you could check for yourself with the help of a multimeter and a basic knowledge of how to use it. Check the vacuum hoses: Check for any cracks or broken hoses between the EGR and the DPFE Sensor. Check the wirings: Use a multimeter and measure the signal, ground, and voltage. Make sure you have 5 volts on the voltage wire and proper ground. If the signal/voltage is not in the range of 0.2 to 4.8 voltage, the P1400 or P1401 will set. Your best bet is to replace the DPFE sensor if you begin to face problems like rough idling and low power because adjusting the sensor to trick the system that everything works fine will not have your car pass the emission test. This can create legal issues and also reduce your engine’s life. Depending on your particular car, the replacement of the DPFE sensor along with the EGR valve should cost between from $150 to $500 including the labor costs, which is also subjective to where you live.